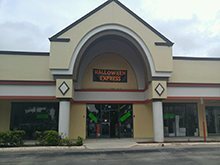 Welcome to Halloween Express Jacksonville, Fl! You can find us on Beach Blvd between Hodges and San Pablo in the Taylor Square Shopping Center. We are a YEAR ROUND store with all the best selections from costumes, wigs, masks, accessories, decorations, and props. We also rent Tuxedos for your weddings and/or your special occasions. Welcome to Halloween Express Jensen Beach/Stuart. We are excited to be back this year providing Treasure Coast with the best in costumes, accessories, props and decorations! We are also your one stop shop for School Spirit Week and Mardi Gras! 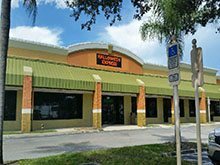 You can find us next to Hobby Lobby and across from the Treasure Coast Mall. We are currently closed, but would like to wish our customers a fun filled summer! 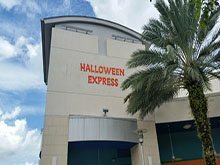 Welcome to Halloween Express in Palm Beach Gardens, FL! For the Halloween Season we will be once again your best option for costumes, wigs, masks, decorations and props! 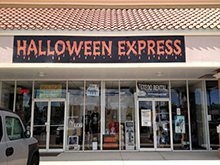 Whether you want to throw a spooky party or find that perfect costume we will have it at Halloween Express. Check out your local Halloween Express located Downtown at the Garden (next to The Yard House) for all your Halloween needs! Thank you for inquiring about Halloween Express serving the Tampa/Brandon. We are located 1 mile west of I75 on RT 60 in Brandon 1 1/2 mile from the Westfield Mall. We specialize in high quality costumes, mask, makeup and decorations for your Halloween party or event. 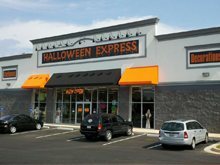 Halloween Express has been servicing our area for over 10yrs and pride our selves in our selection and customer service. As avid Haunters for over 10 yrs we have the experience to help you make your party or Haunt a success !!! Come visit our community bulletin board and share your flyers as well as get information on local Haunts in our communities. Remember Halloween Express is where Halloween comes to shop !!!! Welcome to Halloween Express at Wellington Mall! You can find us this Halloween in the Mall at Wellington at the food court. Halloween 2016 is here and we are gearing up to be your one stop Halloween shop! Count on us to carry the widest selection of costumes, decorations, props and accessories. Opening September 24th. Meanwhile, please visit our other location in Palm Beach Gardens.